There are many types of ships. There are wooden ships, plastic ships, and metal ships. But the best and most important types of ships are friendships. Earlier this week I was telling a friend how lucky we were to have such a pleasant, mild summer with very little rain. Afterward, I forgot to knock on wood. It began raining Friday evening. 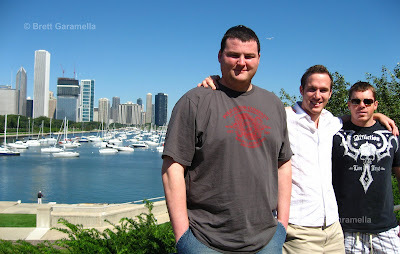 That’s when I reunited with one of my closest college friends, Matt. The rain didn’t let up, but neither did the drinks. It felt like we were back in Chapel Hill. The next day another close friend, Brandon, arrived in Chicago. 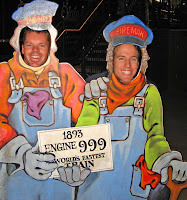 Brandon and Matt grew up together in North Carolina, and were roommates at UNC. I met them in the fall of 2002; I believe on Halloween. They were dressed up as females. As a college freshman I had dressed up as Britney Spears in her school-girl outfit…. we at least had that much in common. Though nothing seems to change when we’re together, it has been a while since we graduated in May 2004. Since then Brandon became a police officer, got married, and bought a house. Matt bought a house as well after he quit teaching and began selling boats. And I think I’ve finally mastered the art of opening doors and carrying luggage for hotel guests. They both flew in from North Carolina before the cold Chicago weather. They stayed at the hotel where I work. Thankfully, I had three straight days off. Of course we went out Saturday night and reverted back to our college years. However, our bodies don’t seem to recover like they used to. It’s human nature to push oneself well beyond reasonable limits, especially among close friends. Though it rained we managed to see the sights and do some serious eating at Gino’s East and Zed 451. 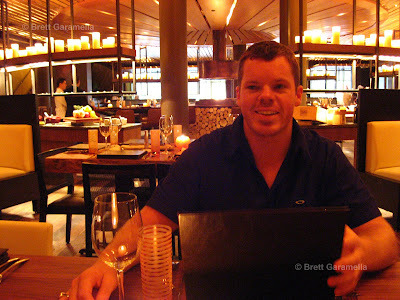 At the latter, a fancy Brazilian, all-you-can-eat steakhouse, we enjoyed the dozen or so meats and fishes brought to our table after feasting on a salad bar filled with things I couldn’t name. We left with full bellies and empty wallets. Today, we ate less and did more. 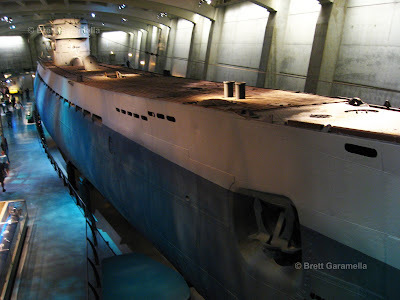 At the Museum of Science and Industry -- in the Hyde Park neighborhood next to Lake Michigan -- we went inside the only German submarine in the United States, the U-505 from WWII. Each time I see this massive submarine I am amazed at how they hauled it ashore and then built the museum walls around it. Apparently two of its crew members have visited it. Talk about a flashback. We also were able to take an elevator shaft deep into a recreated coal mine where we road on a miniature train and saw how the miners survived. Living in Chicago you don’t usually think about all the coal mines in southern Illinois. 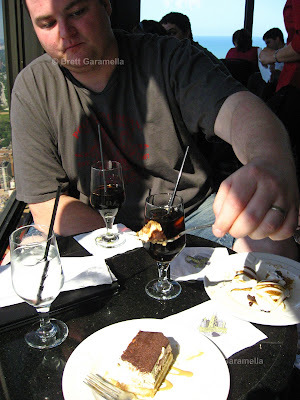 Nor do you think about the Grand Canyon, which we saw on the domed OmniMax screen. 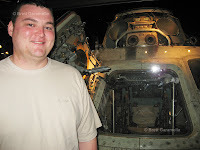 Although I’ve been to it many times, the Museum of Science and Industry seems interesting every time I go. And it’s fun! Brandon got a kick out of watching Matt rush me over to take a photo of him sticking his head through an empty, wooden space of an astronaut caricature. 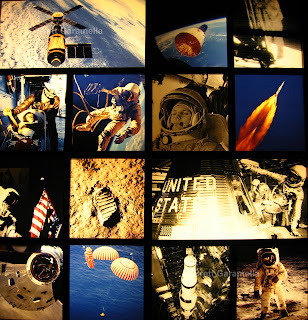 It was only humorous because Matt had ignored the nearby Apollo 8 capsule that had first orbited the moon. 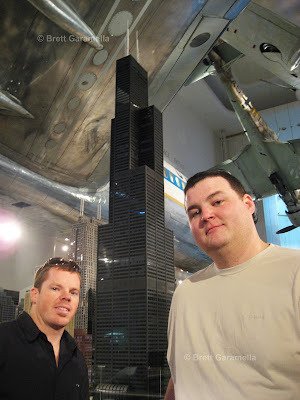 The museum is not only the largest in Chicago, it’s free on weekdays, boasting a 3,500 square foot model railroad. It reminded me of the train set my dad had kept since his childhood. 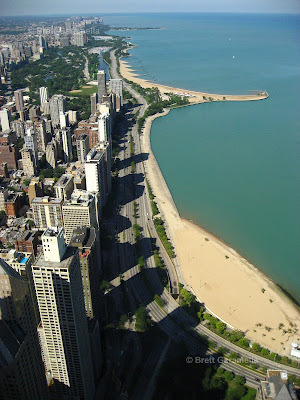 We then visited the Shedd Aquarium and the John Hancock Tower, where there is a lounge at the 95th floor to eat and drink. Having my close friends visit, I spent time really enjoying the city. 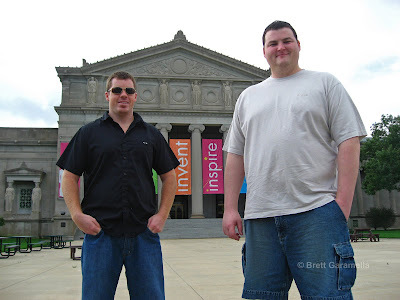 And though the Chicago weather wasn’t the greatest, Brandon and Matt are a reminder that it isn’t always where you are but who you’re with that makes it fun. He sits in silence at his locker with his feet up, hands on head and eyes closed. No one is near him as he eventually opens his eyes. 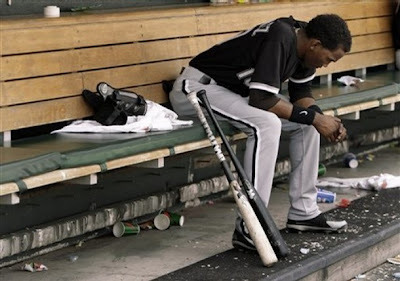 After putting a shirt over his skinny torso, Alexei Ramírez begins inspecting his custom-made bats, oblivious to most of his teammates at the far end of the locker room watching ESPN and playing cards. Moments earlier Ramírez struck out in the ninth inning as the White Sox lost the first game of a doubleheader. Indeed, Ramírez has much to think about. Above his locker is a small Cuban flag with the words CUBA POR SIEMPRE or Cuba Forever. Below the flag are autographed photos of him and White Sox pitcher José Contreras. Growing up they played together for two seasons for their hometown team Pinar del Río in Cuba before defecting to the United States. Contreras is a veteran player on the disabled list and near retirement. Ramírez, however, is nearing the end of his first season as the White Sox’s starting second baseman. This is his first year in the United States. I wait until he finishes inspecting his bats in solitude. 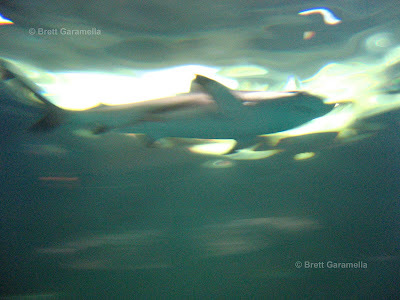 Then I introduce myself and show him photos I had taken while visiting Cuba. Ramírez smiles when he sees the baseball stadium in his hometown. He immediately recognizes a baseball coach in another photo. With a population of about 125,000, Pinar del Río is about 105 miles southwest of Havana. It is surrounded by the world’s best tobacco farming and is known for its pastel-colored, neoclassical buildings with decorative art nouveau frontages. To say its people are friendly and hospitable is an understatement. Like most of Cuba, this bodes well for its two largest economic industries, cigars and tourism. Foreigners, however, prefer relaxing along the beaches or gazing at the beautiful scenery in the nearby town, Viñales. 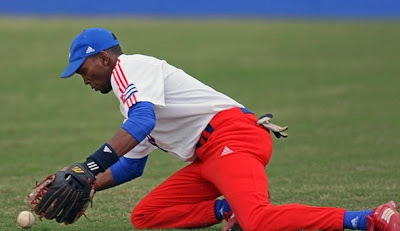 This is why Pinar del Río doesn’t have much going on other than baseball. And so here begins Ramírez’s story. He tells me about how he began playing baseball at age 7. His mom didn’t want him playing because she thought he was too small, but his first coach convinced her otherwise. Ramírez soon was given the nickname Pirineo, or little kid, from a close friend because he was always the smallest player on the field. Off the field he didn’t have any hobbies, and so baseball consumed much of his free time. His single-mindedness paid off. By age 21, Ramírez batted .342 in his first full season in Cuba’s professional league. Fully grown he earned a new nickname, “the Cuban Missile” because of his combination of power and speed. 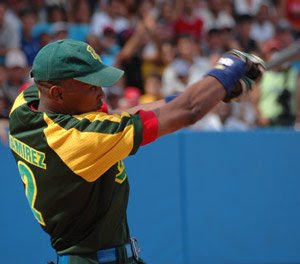 At the 2006 World Baseball Championships, Ramírez batted .375, attracting scouts attention in the process. 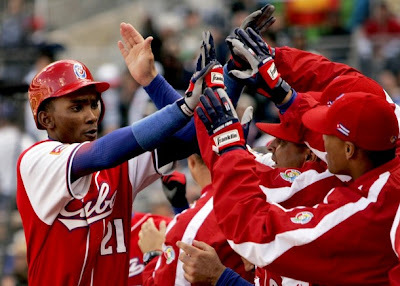 In 2007 he led Cuba’s pro league with 20 homeruns in 89 games. It was obvious his skills had outgrown Cuba. He also had experience playing shortstop and centerfield. It was his family life, however, that would soon change his baseball career. 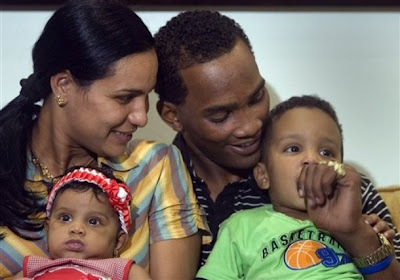 By September 2007, he had married a Dominican named Mildred, who got her medical degree in Cuba, and they had two children. At that time Ramírez, 25, obtained a tourist visa to visit her family. Once in the Dominican Republic he applied for residency. In the D.R. he began trying out for Major League Baseball teams as a free agent. 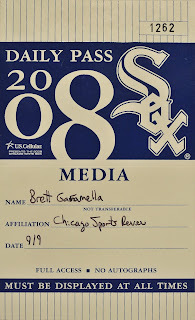 On Dec. 21, 2007 he signed a four-year contract with the White Sox for $4.75 million. Sometimes Ramírez thinks about how much his life has changed. How he spent seven years traveling to games in the same bus that ordinary Cubans use when traveling to other towns. How he made less than a hundred dollars per month playing the same game that he now is paid millions to play despite being unable to talk to most of his teammates (he doesn’t speak English). How in many ways at 6’3”, 185 pounds he is still a skinny baseball player. Ramírez says he has spent a lot more time studying pitchers in the United States than he had in Cuba. His statistics are not much different than in Cuba. Among White Sox starters, he has the highest batting average (.296) while hitting 20 homeruns (setting a MLB rookie record with 4 grand slams, the most this year). In the clubhouse Ramírez seems a lot more reserved than many of his Latino teammates. When he isn’t playing baseball he is with his wife and three children. 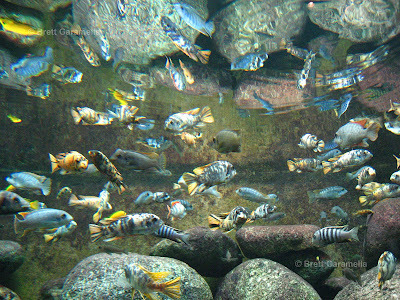 He enjoys eating at different Latin restaurants or taking his children to the park. The rest of his family is in Cuba and he calls home as much as he can. He takes each day as it comes, he says, and doesn’t outline his goals. When mentioned of returning to Cuba, he says he eventually would like to, but he made me promise I wouldn’t talk about anything political. Thus, even in America he abides by Cuba’s unspoken rules to keep quiet about taboo subjects such as defecting and politics. Beyond politics, Ramírez will have plenty to think about. Much of that passion comes from the fact that Latinos don’t have the exposure or option of playing other sports. In addition, it is a year-round sport in the Caribbean and children are playing outside rather than watching television or playing video games. For some, their lives will change overnight just like Alexei Ramírez. 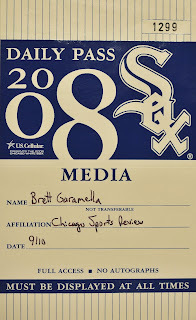 This Alexei Ramírez story first appeared in The Chicago Sports Review.